A fluted glass candle cup rests upon a simply stunning scrolling metal frame to create a lighting accent that leaves a lasting impression. 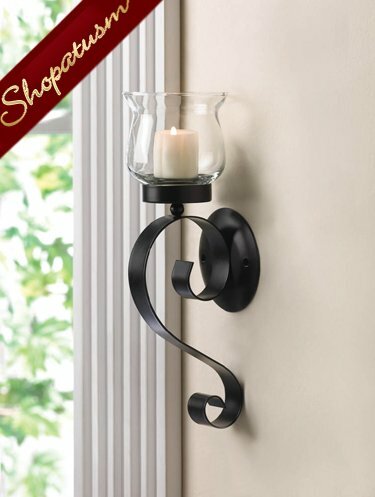 Mount it to the wall in any room and add the candle of your choice to enjoy the ambiance of flickering candlelight. Item Weight: 0.8 lb. 3 3/8 inch x 3 3/4 inch x 10 1/2 inch high; glass holder: 3 3/8 inch x 3 3/8 inch x 3 1/2 inch high. Iron and glass. Candle and hardware not included.